Angels rookie Shohei Ohtani homers in second straight game. April. 06, 2018 09:11. by Heon-Jae Lee uni@donga.com. From a mediocre minor leaguer to the reincarnation of Babe Ruth. It only took three games for his label to take such a dramatic turn. Shohei Ohtani, the 24-year-old Japanese pitcher and designated hitter for the Los Angeles Angels, is fast emerging as a super star in the Major League Baseball (MLB) with highly impressive performances. On Wednesday (local time), the versatile Japanese pitcher pulled off two hits and two runs in five at-bats including a homer as a designated hitter against the Cleveland Indians. In the bottom of the fifth inning, the Japanese rookie homered off a 94-mile fastball from two-time Cy Young Award winner Corey Kluber, sending the ball over the center fence of the stadium. Ohtani notched another hit in the tenth inning up in the middle. The Japanese pulled off homers and multi hits for the second straight game straight, following the three hits and a three-man home run from a day earlier. His batting average has soared to 0.429, and the Angels reversed the game 3-2 thanks to a game-ending homer by Zack Cozart in the 13th inning. On Sunday, Ohtani notched a win as a starting pitcher against the Oakland Athletics, allowing three runs in six innings. “Hitting two home runs in a row after being a winning pitcher is a feat that even the God of Baseball Babe Ruth did not achieve,” the Japanese Daily Sports said, citing “Baseball-Reference.com,” a data archive website for the Major League Baseball. 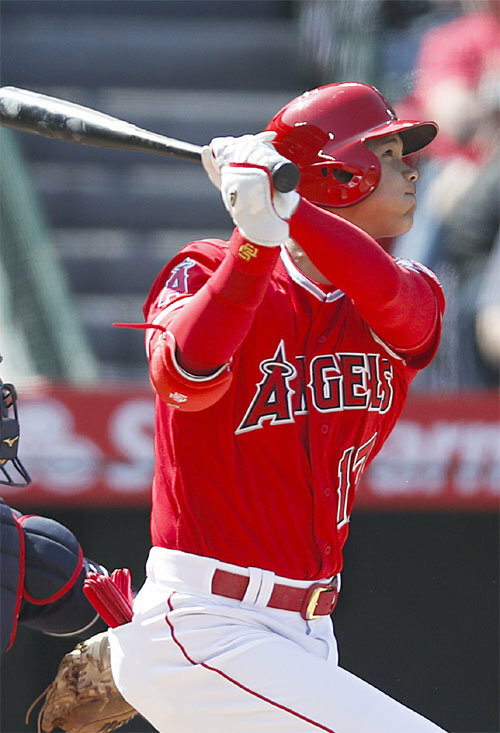 During the tryout games in March, Ohtani failed to impress the audience, with critics playing him down as a “minor leaguer.” In the two games he played as a pitcher, Ohtani allowed eight runs and nine hits in two and 2/3 innings, and his batting average stood at 0.125 (four hits in 32 at-bats). Now, attention is being paid to whether he will be able to follow Babe Ruth’s footsteps. Exactly 100 years ago, Babe Ruth notched 10 wins and 10 homers as a pitcher and hitter, which was the first and the last monument in Major League history. In that year, the baseball legend pulled off 11 home runs, and recorded 13 wins and seven defeats as a pitcher. This season, Ohtani will take the plate as starting pitcher once a week, and play as designated hitter roughly in three games between the rotation of pitchers.